The Seahawks had not used the tag since 2010 but did on Clark as the hopes of getting a long-term deal done now did not materialize. 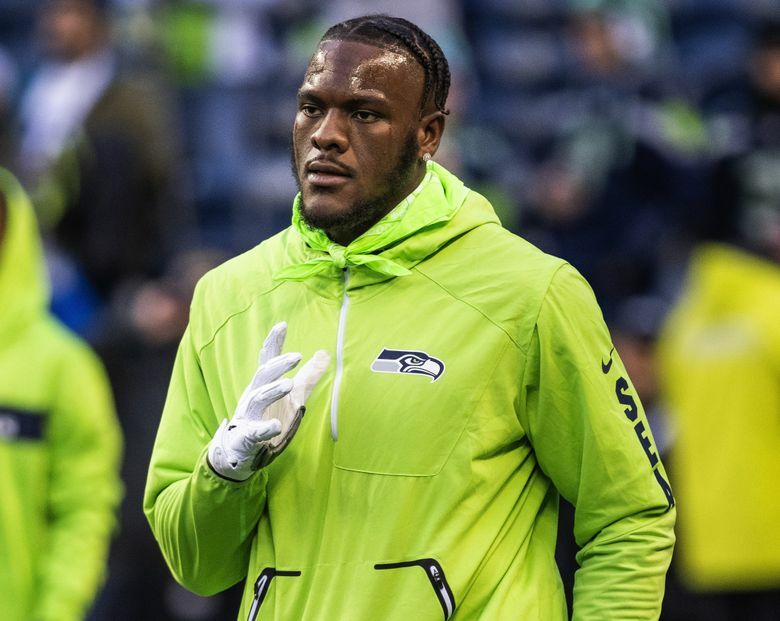 Seahawks coach Pete Carroll has said for months the team would not let defensive end Frank Clark, whose initial four-year rookie contract ran out after the 2018 season, get away. The team made sure of that Monday afternoon — for at least the 2019 season, anyway — by placing the franchise tag on Clark, making him one of four edge rushers in an increasingly heated pass-rushing market to get the tag in the span of a few hours. The Seahawks have been talking to Clark and his representatives for months and have been hoping to get a long-term deal done with the defensive end, who was set to become an unrestricted free agent March 13. But with those talks proving fruitless for now — the two sides will keep talking to try to get a long-term deal done — the Seahawks will use their tag on Clark to assure he stays with the team in 2019. Seattle used the nonexclusive tag on Clark, which means he can negotiate with other teams in free agency but if he were to sign elsewhere the Seahawks could match the contract and keep him or get two first-round draft choices as compensation (and with two picks being such a stiff price to pay, logically no other team will sign Clark). Getting the tag means Clark will receive a one-year contract at $17.128 million that is fully guaranteed but also counts fully against the team’s 2019 salary cap. The deadline to use a tag for the 2019 season was Tuesday and teams can use it only once per year. The tag represents a big raise for Clark, who made $943,941 last season in the final year of a rookie contract that paid him $3.73 million overall. Still, Clark, who turns 26 in June, is hoping sooner rather than later to get a bigger payday and more long-term security. That the tag can be viewed as a no-win situation for either side — the player doesn’t get the long-term security he wants and the team takes a big immediate cap hit with still no assurance the player will be around for the long haul — it is not often used. In fact, Seattle had not used a franchise tag since 2010 on kicker Olindo Mare. But both Carroll and general manager John Schneider said at the NFL combine last week the team would use it if needed to keep the Seahawks’ best pass-rusher in the fold for 2019. “Frankie will be with us, yeah,” Carroll said last Thursday when asked about Clark’s status for 2019. But Carroll said then the hope would be that a long-term deal would get done even if the tag was used on Clark, who has missed just one game in four years and last season led the team with 13 sacks. But with three other of the best defensive ends/edge rushers in the NFL also potentially set to become free agents and also getting the franchise tag Monday — including Kansas City’s Dee Ford, Houston’s Jadeveon Clowney and Dallas’ Demarcus Lawrence — finding the right price for Clark was difficult for each side at the moment. Teams can continue to negotiate with franchise-tagged players until July 15. After that date, then teams cannot negotiate again with tagged players until after the season. Former NFL agent Joel Corry, who now writes about salary cap issues for CBSSports.com, speculated last month that it was possible none of the big four defensive end free agents — Lawrence, Ford, Clowney and Clark — would sign and might all get tagged. Schneider seemed to indicate at the combine that Clark understood why the tag might be used and that it wouldn’t be a hindrance to getting a long-term deal done. Clark was Seattle’s first choice in the 2015 draft, taken 63rd overall. His 35 sacks in four years are the second-most of anyone in that draft class, topped only by the 40 of Minnesota’s Danielle Hunter, who re-signed with Minnesota before last season to a five-year deal worth $14.4 million. At the time that deal was thought as possibly setting a bar for Clark and the other potential free agents in this class. But instead, the market for edge rushers has moved far past that number. The Seahawks entered the day with an effective cap space of $48 million for 2019, according to OvertheCap.com, which now drops to about $31 million with the free agent signing period now nine days away. One reason the Seahawks would be motivated to get a long-term deal done with Clark is to lessen the cap hit for 2019 — the cap hit could be spread out over multiple years. But that also means making a much longer commitment to Clark, as well as an immediate guarantee likely in the $50 million range. While Seattle will undoubtedly continue to talk with Clark — who is represented by Erik Burkhardt, who also represents Kyler Murray — putting the tag on Clark also means the Seahawks can begin to make other moves with an understanding of what their cap for 2019 might be. Among those moves is to figure out which of the team’s restricted free agents to give tenders — offensive tackle George Fant seems the most likely — as well as talking to agents of the other 13 players who at the moment can become unrestricted free agents next Wednesday, notably linebacker K.J. Wright, guards J.R. Sweezy and D.J. Fluker and cornerback Justin Coleman. Free safety Earl Thomas also will be a free agent next week but no one considers it likely he will consider Seattle, or that the Seahawks would make him an offer. Eventually this offseason, the Seahawks also will look into giving extensions to three key players who can become free agents following the 2019 season — quarterback Russell Wilson, linebacker Bobby Wagner and defensive tackle Jarran Reed, with Wilson likely a specific priority. The Seahawks would not want to have to tag Clark again so they could have it available or Wilson or Wagner, if needed, meaning Seattle will have to get a long-term deal done with Clark at some point over the next year or risk losing him following the 2019 season.